She left her friends and turned homeward to Kahuku. At Waialua she encountered a wind and rain storm. The water poured down the hillsides and washed out the trails, but she cared not at all. At Waimea she went along the shore in the storm. The river of Waimea almost overflowed its banks and the beach was full of people. In the olden days the natives of Waimea enjoyed riding the huge surf up into the stream when it was slightly swollen. This sport was called waipueone. Thus our traveler crossed Waimea on a surfboard without encountering trouble. This was said to be a favorite sport of the olden days and the boards did not sink when managed with skill. Waimea, or “reddish water,” is the first place on O’ahu where contact was made between foreigners and Hawaiians. After Captain Cook was killed at Kealakekua Bay on February 14, 1779, his two ships, the Discovery and the Resolution, anchored at Waimea for water on their way to Kaua’i. Cook’s officers described the bay as picturesque, beautiful, well-cultivated, and heavily populated. In 1793, Captain Vancouver’s store ship, the Daedalus, brought the second group of foreigners to Waimea. They, too, anchored in the bay for water and sent a small boat ashore. While the crew was filling their barrels in the stream, two of them were killed in an attack by Hawaiians who wanted their weapons. The Hawaiian community remained in Waimea until 1894, when a flood devastated the valley, destroying most of the house sites. In the aftermath, few of the displaced residents returned. In 1929, C.W. Winstedt won the contract to build Kamehameha Highway from Waimea to Kahuku. In 1930 he set up the Waimea Rock Quarry to produce gravel for his project, abandoning the site in 1932 after the road was completed. In April 1953 the Catholic mission transformed the facility into a church, the Saints Paul and Peter Mission. The machine sheds were converted into a patio and chapel and the tall storage bins became the church tower, now one of the North Shore’s most famous landmarks. Waimea Bay is one of the most famous big wave surf sites in the world. Waves breaking on the north point of the bay often reach heights of 25 feet, attracting many of the best riders in the international surfing community. A unique surfing contest called “The Eddie” is held here during the winter months if surf heights consistently reach 20 feet or higher. Officially known as the Quicksilver in Memory of Eddie Aikau Big Wave Invitational, the event honors Eddie Aikau (1946-1978), a veteran big wave surfer and lifeguard at Waimea Bay. The contest has only been completed five times since it was first held in 1986. Winners were Clyde Aikau (1986), Keone Downing (1990), Noah Johnson (1999), Ross Clarke-Jones (2001), and Kelly Slater (2002). 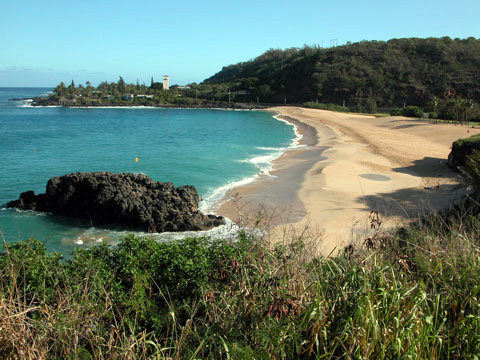 During the summer months the wide sand beach at Waimea is a popular swimming, snorkeling, and fishing site. In 2002, the Pupukea Marine Life Conservation District (MLCD) fronting Pupukea Beach Park was expanded to include the bay and the Wananapaoa Islands. The MLCD rules permit only hook-and-line fishing from the shore of the bay. Public amenities: parking, restrooms, picnic tables, showers.